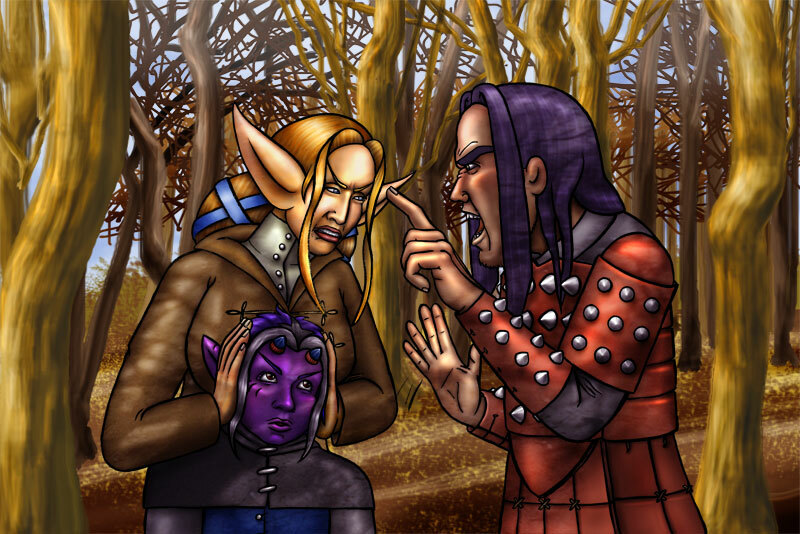 Interparty Conflict is the final piece of card art for the WAGON Webcomic Battle Cardgame which is on pre-order right now! I’m not exactly sure what the cards effect will be yet, but something along the lines of characters belonging to the same group fighting with each other! I thought this was a suitable Plot Device to reflect Epic Fail because, as you all know, it happens in the comic all the time! You can’t see the plot through characters squabbling with one another! I decide to use Dirk, Tinuvelle and Yoru on this card because they don’t have their own Character cards like Amuletts, Clodin and Martin and I didn’t want them to be left out. I thought covering Yoru’s ears so he doesn’t hear any bad language would be the sort of sweet, protective thing Tinuvielle would do. Don’t ask me what they are arguing about – I haven’t a clue. I just had fun doing the facial expressions. By the way I found a fun Video on YouTube about interparty conflict in D&D. Just thought I’d share.